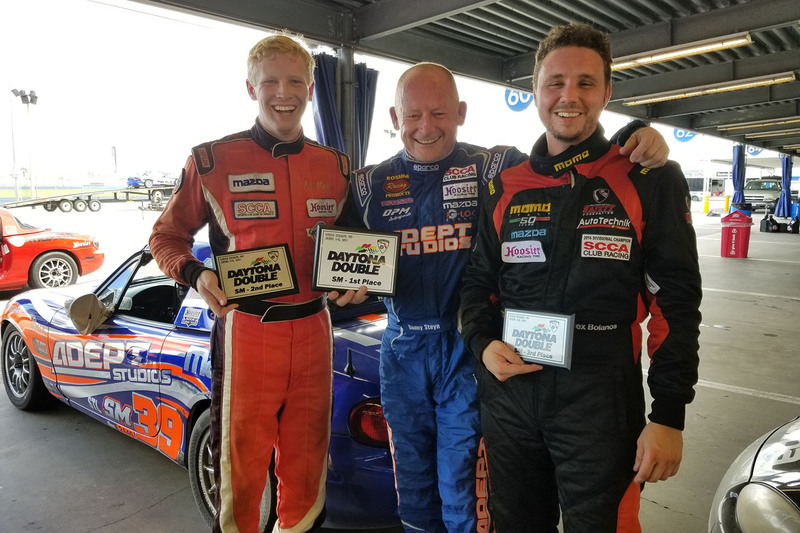 Home / Years / 2018 / Carter and Steyn lock out front row and Steyn sets new Spec Miata track record at Watkins Glen! 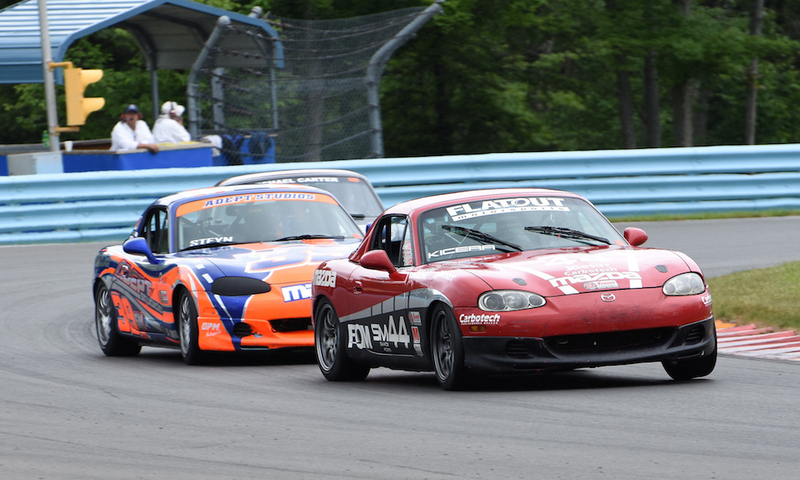 The historic town of Watkins Glen played host to the final round of the 2018 SCCA Hoosier Super Tour series. 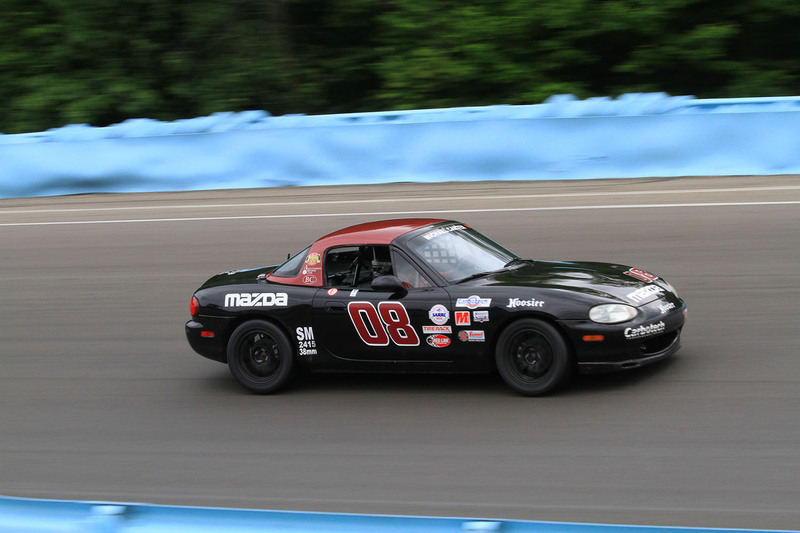 Since its inception in 1948, the Watkins Glen track has become legendary for hosting just about every form of road racing from NASCAR to INDY to Formula 1 and this weekend 26 SCCA classes competed in 7 run-groups. 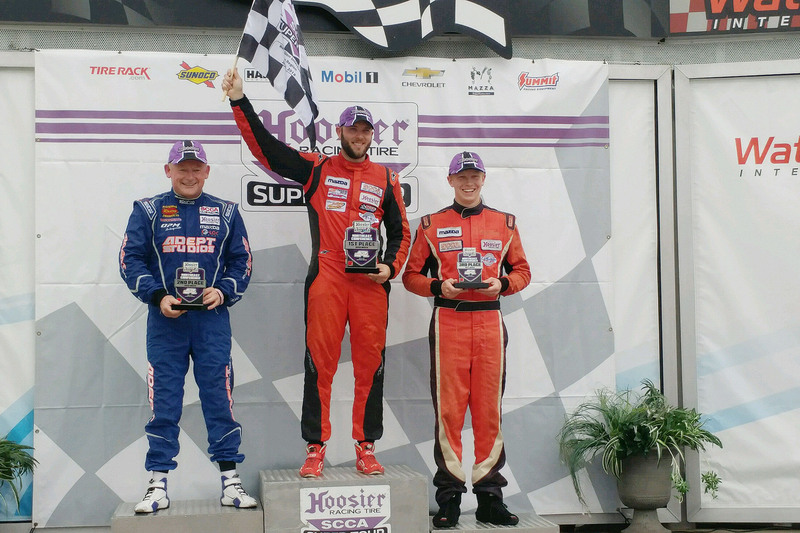 Rossini drivers Danny Steyn, Michael Carter and Ralle Rookey were there to do their best to take home the trophies. 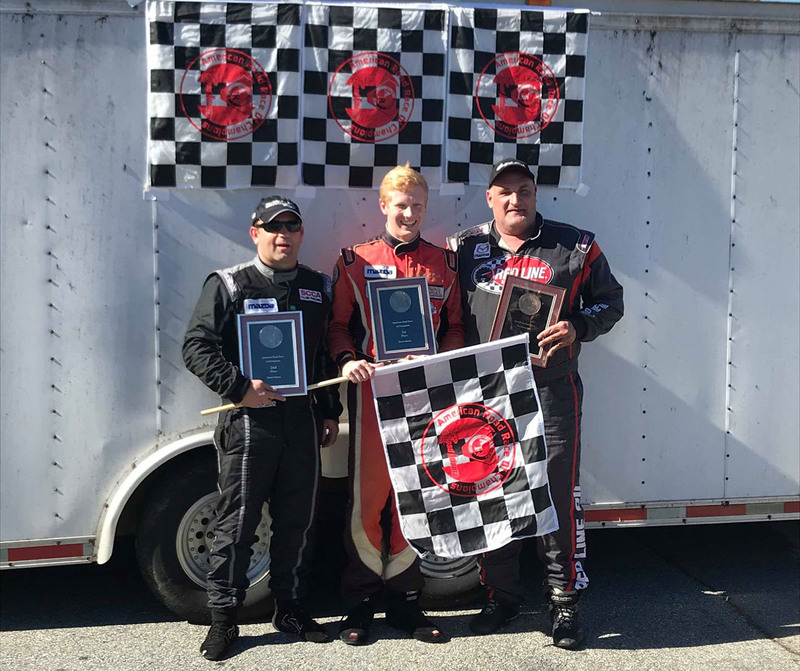 In Qualifying, on a track where drafting plays a huge part in lap times, Steyn and Carter worked together and pulled off the impossible, locking out the front Row ahead of Tyler Kicera and Elivan Goulart. Ralle Rookey qualified in 6th place. 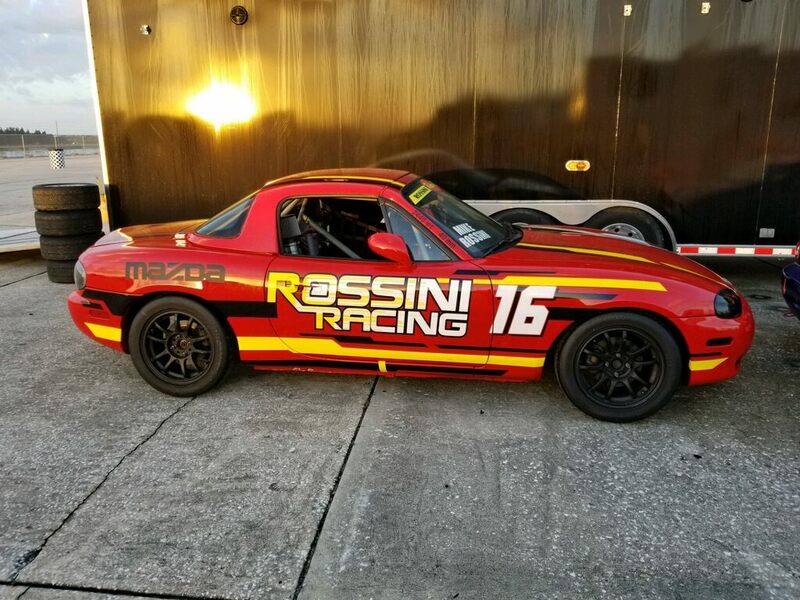 Carter, who had never been to the track before, and did not do the test day, finished on pole, out-qualifying Steyn by 5/100ths of a second. 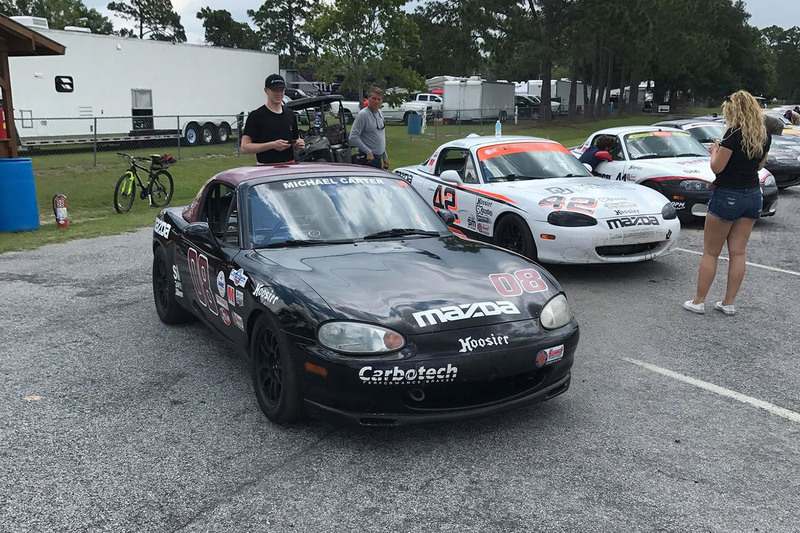 In Race 1, Carter got freightrained on the back straight and dropped back to 6th place but quickly started making his way to the front. Steyn, Kicera and Goulart were all over each other at the front, and in the epic dice with Goulart pushing Steyn to the bumper of Kicera, Steyn set a new lap record of 2:15.487. Shortly thereafter Steyn’s car died with cam sensor issues and the race up front was between Kicera, Goulart and Carter who had caught up to them. 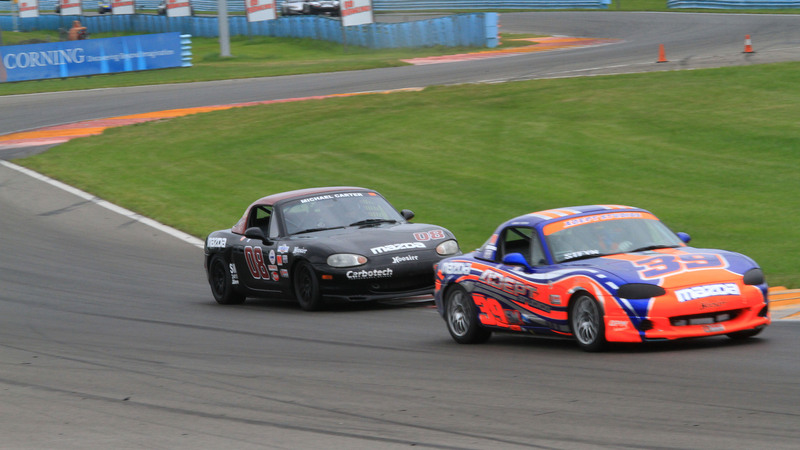 On the final lap, Carter managed to get ahead of Goulart to finish 2nd behind Kicera. Goulart was third, Nick Leverone 4th and Ralle Rookey 5th. Race 2 was held in slightly damp conditions with rain threatening. The start was sketchy as the front straight and they uphill esses were wet but the rest of the track was relatively dry. Most drivers went out on dries with only Goulart and a few others opting for rain tires. At the start, Goulart pulled away to the early lead, but in the dry section, Steyn quickly got ahead and started to pull away. As the track dried, Kicera and Carter caught Steyn and a great battle was waged at the front with several lead changes.